The International Council for Machinery Lubrication (ICML) recently announced two new management-level offerings. 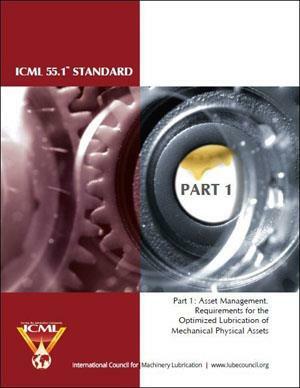 First is the ICML 55 standard, which defines the optimized management of lubricated mechanical assets. Second is the Machinery Lubrication Engineer (MLE) certification aimed at individuals responsible for designing, implementing and managing lubrication programs. The ICML 55 requirements publication ICML 55.1, which defines 12 interrelated areas of sustainable lubrication program plans, will be released for purchase on April 16 at the Reliable Plant Conference & Exhibition in Cleveland, Ohio. The conference, which is organized by Noria Corporation, will also serve as the host site for the very first public MLE certification exam on April 17. ICML personnel will conduct introductory presentations and maintain an exhibit at booth #144. 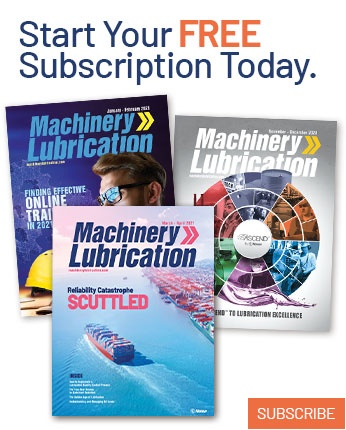 "The MLE and ICML 55 offerings together represent the culmination of many years of work on the part of many, many technical experts in the fields of machinery lubrication, oil analysis and asset reliability," says Leslie Fish, ICML executive director. "In response to market demand from practitioners worldwide, our comprehensive MLE certification builds on the groundwork laid by our Machine Lubricant Analyst (MLA) and Machinery Lubrication Technician (MLT) certifications. Furthermore, the ICML 55 standards now provide a framework for companies to achieve systematic progress toward their broader organizational asset management strategies and goals. We believe these two complementary offerings will open up new doors of opportunity and success for participating companies and professionals." ICML began developing ICML 55 following the International Organization for Standardization's publication of the ISO 55000 asset management standard in 2014. ICML saw the need for a highly tactical, lubrication-specific standard that would supplement the more general ISO document. With technical contributions from a team of more than 40 experts, ICML 55 fills that gap with specific requirements and guidelines to establish, implement, maintain and improve consistent lubrication management systems and activities. "ICML 55 is a fantastic way to merge best practices globally into one readable document," says Rendela Wenzel, an associate senior consultant engineer at Eli Lilly and Company who also serves on the ICML board as director of the ICML 55 initiative. 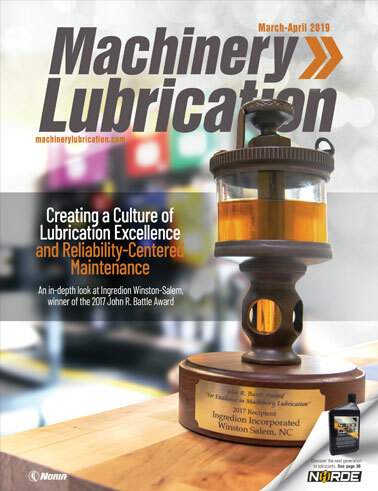 "This standard provides a 'how-to' guide for lubrication excellence and represents best practices by subject-matter experts from all over the world." ICML 55.1 is intended to be a companion document in association with ICML 55.2, "Guideline for the Optimized Lubrication of Mechanical Physical Assets," and ICML 55.3, "Auditors' Standard Practice and Policies Manual." These two documents are targeted for publication by year-end 2019 and 2020, respectively. Eventually, an organization will be able to arrange for a qualified ICML 55 auditor to certify its compliance across all 12 areas, thus publicly validating that its lubricated asset management program has achieved optimum performance at the highest levels of machinery reliability. "We look forward to the enormous but exciting challenge of launching this new standard into the global lubrication and reliability community," says ICML board member Jim Fitch, who is also the CEO and co-founder of Noria Corporation. "This is a monumental event that will change the face of lubrication in the context of reliability and asset management forever." MLE targets reliability and asset leaders with a strong emphasis in lubrication and oil analysis. The 150-question exam evaluates an individual's knowledge, understanding and ability to provide engineering support at a typical industrial plant, whether serving on staff or as a contractor/consultant. "Plant lubrication management professionals have needed a signature certification as a validation of their skills and experience for a long time now," says ICML technical contributor Mike Johnson. "The MLE should be that certification." ICML strategically mapped the MLE body of knowledge to ICML 55, which makes MLE certification ideal for those leading institutional compliance with ICML 55.1 requirements as a tactical step toward ISO 55001 certification. Plants that choose to certify or hire MLE personnel can expect them to comprehend ICML 55's framework and ensure that all relevant factors impacting lubricated asset decision-making are adequately considered by key stakeholders. "Ensuring the competency of those empowered to develop lubrication programs that conform to ICML 55.1 through MLE certification is the first step in creating long overdue consistency around lubrication practices in our industry," notes Mark Barnes, who serves on ICML's MLE development committee. While there is no MLE prerequisite to hold a professional engineering degree or any other ICML certification, candidates likely will find that MLA and MLT training and certifications can be helpful as they prepare for the MLE. Registration for the April 17 MLE exam is currently open. Interested parties can review the body of knowledge and arrange for this or other MLE exam sessions through ICML's website at www.lubecouncil.org. To purchase copies of the ICML 55.1 requirements publication, contact the ICML office at info@lubecouncil.org.